Nothing good happens in life without adequate attention, dedication and love. 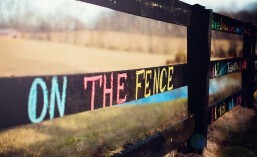 It can be applied to your career, to your friends, to your pets, and the list can go on and on. 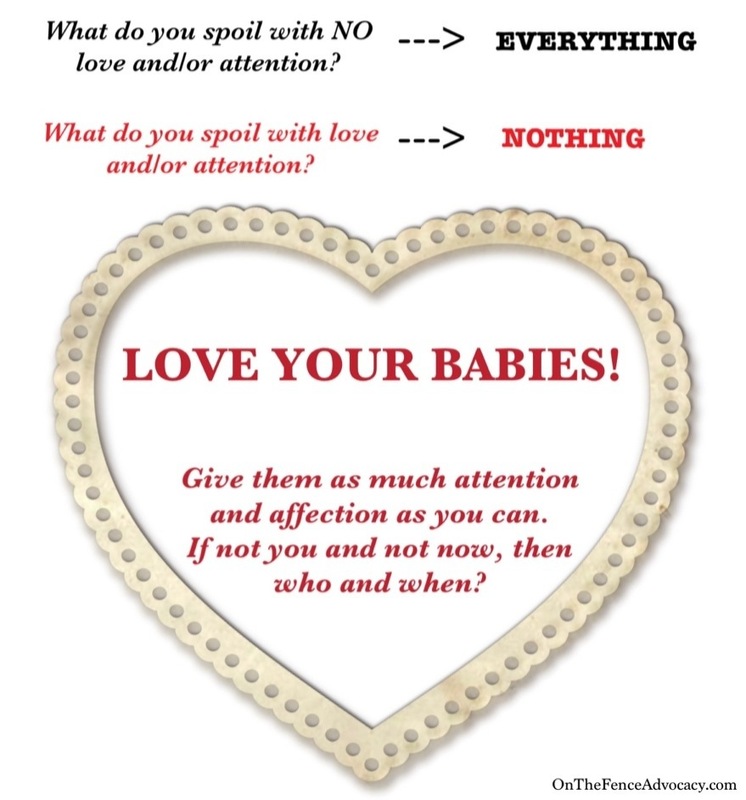 But most importantly, nothing good happens when you start withdrawing your love and attention from your family, especially your babies. Listen to your instincts more, love them, hold them, don’t listen to those telling you otherwise. Your babies count on you! “Letting babies “cry it out” is an idea that has been around since at least the 1880s when the field of medicine was in a hullaballoo about germs and transmitting infection and so took to the notion that babies should rarely be touched. The fact is that caregivers who habitually respond to the needs of the baby before the baby gets distressed, preventing crying, are more likely to have children who are independent than the opposite. Soothing care is best from the outset. Once patterns get established, it’s much harder to change them. The first year of life is a sensitive period for establishing a sense of TRUST in the world, the world of caregiver and the world of self. 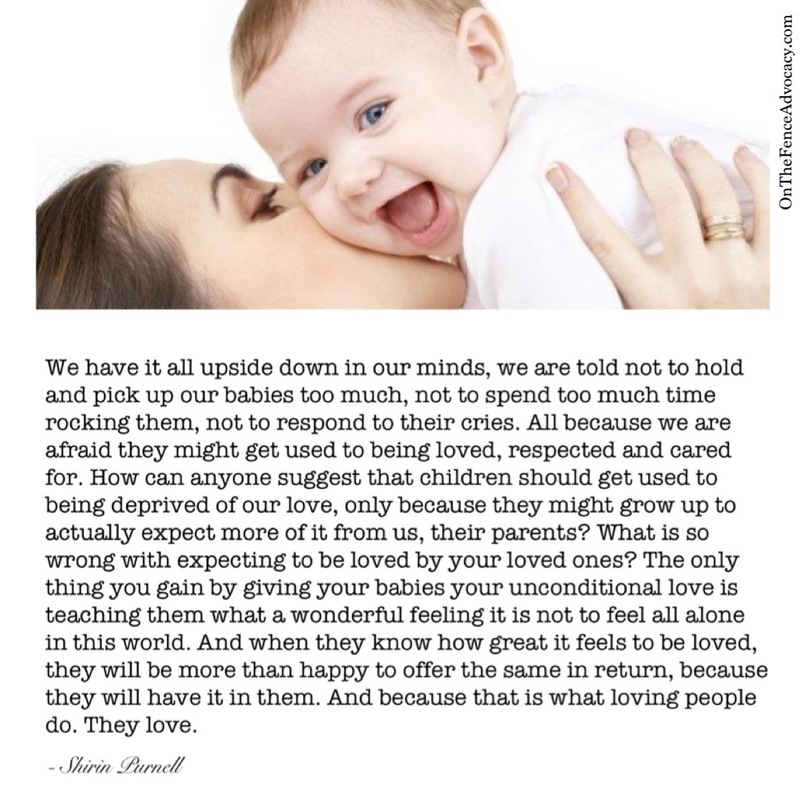 When a baby’s needs are met without distress, the child learns that the world is a trustworthy place, that relationships are supportive, and that the self is a positive entity that can get its needs met. When a baby’s needs are dismissed or ignored, the child develops a sense of MISTRUST of relationships and the world. And self-confidence is undermined. The child may spend a lifetime trying to fill the inner emptiness. A caregiver who learns to ignore baby crying, will likely learn to ignore the more subtle signaling of the child’s needs. Second-guessing intuitions to stop child distress, the adult who ignores baby needs practices and increasingly learns to “harden the heart.” The reciprocity between caregiver and baby is broken by the adult, but cannot be repaired by the young child. The baby is helpless. No. A crying baby in our ancestral environment would have signaled predators to tasty morsels. So our evolved parenting practices alleviated baby distress and precluded crying except in emergencies. Babies are built to expect the equivalent of an “external womb” after birth. What is the external womb? —being held constantly, breastfed on demand, needs met quickly. These practices are known to facilitate good brain and body development. When babies display discomfort, it signals that a need is not getting met, a need of their rapidly growing systems. 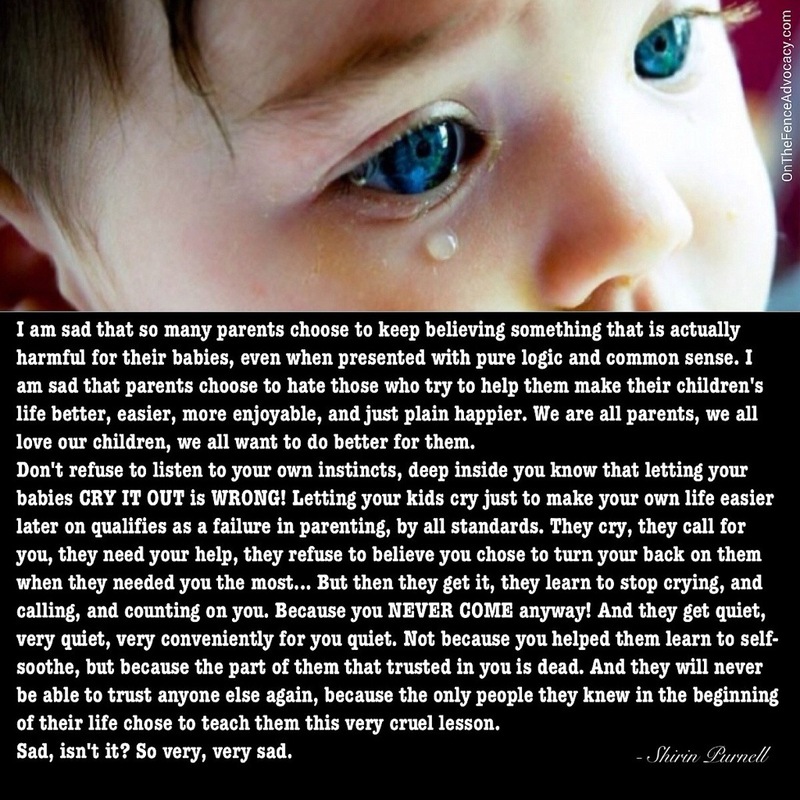 This entry was posted in What Parents Should Know and tagged Baby, Cry-it-out, Parenting. Bookmark the permalink. ← How hard is parenting?